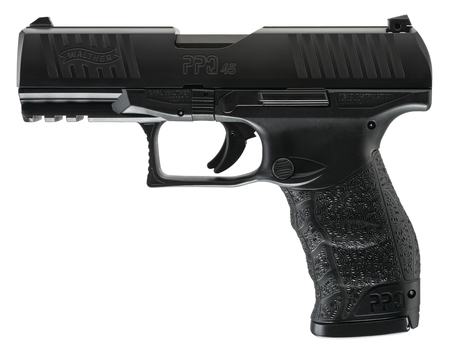 Walther Model PPQ M2 .45 ACP 4.25 Inch Barrel Black Tenifer Finish Adjustable Sights Picatinny Rail 12 Round. Low profile three-dot polymer combat sights. Mil-std 1913 picatinny rail. Tenifer coated slide and barrel. Serrated trigger guard. Quick defense trigger. Ambidextrous magazine release button. Ergonomic Walther grip. Ambidextrous slide stop. Front and rear slide serrations.